This artist's rendering of the planetary system of HR 8799 130 light-years from Earth as it may have appeared at an early stage in its evolution. The image shows the giant exoplanet HR 8799c, as well as a disk of gas and dust, and interior planets. Image added March 14, 2013. The glowing atmosphere of a strangely giant alien world could help solve mysteries of not just how it formed, but how our own solar system arose, scientists say. The exoplanet discovery comes from the most detailed look yet at the alien planets around the distant star HR 8799, which lies about 130 light-years from Earth. The HR 8799 system is home to four giant planets orbiting a relatively young, 30-million-year-old star, with each planet far larger than any world found in Earth's solar system. The planets orbiting HR 8799 weigh in at between five to 10 times the mass of Jupiter and are still glowing with the heat of their formation, allowing researchers to directly image them. "It's the only system in which multiple planets can individually be seen," said study co-author Bruce Macintosh, an astronomer at Lawrence Livermore National Laboratory in California. The planetary system resembles a scaled-up version of our solar system, suggesting there may be smaller Earth-size planets closer in, although the researchers currently have not yet seen any. One of the discovery images of the supersized alien solar system around the star HR 8799, about 130 light-years from Earth, obtained by the Keck II telescope using an adaptive optics system and NIRC2 Near-Infrared Imager. The rectangle indicates the field-of view of the OSIRIS instrument. Image added March 14, 2013. The astronomers concentrated on one of the star's visible planets, named HR 8799c, a colossal gas giant about seven times the mass of Jupiter. It circles the star HR 8799 at a range comparable to Pluto's distance from the sun. The birth of such a massive planet at such a great distance from its parent star conflicts with the two popular models of planetary formation. In the multistep process known as core accretion, gas slowly accumulates onto a planetary core, while the mechanism known as gravitational instability involves the simultaneous creation of a planet's interior and atmosphere. 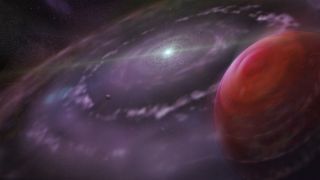 "In the traditional core accretion model of planet formation, it is difficult to form planets as large as the HR 8799 planets at such large distances from their parent star," Konopacky told SPACE.com. "Typically, in this model, objects the size of Jupiter or larger must form much closer to their parent star. This is for several reasons, but has a lot to do with there being less material at large distances from the star that can form planets." "In the gravitational instability method of formation, it is possible to form big planets at large distances, usually because they invoke a much more massive disc of material," Konopacky added. "But the model generally predicts that there should be many more massive objects orbiting lots of other stars at these distances, and these kinds of objects have not been discovered in surveys [of many stars for exoplanets]." To help solve this mystery, the scientists analyzed the glow from HR 8799c using a high-resolution imaging spectrograph called OSIRIS at the Keck Observatory in Hawaii. Molecules in atmospheres can absorb light, resulting in patterns known as spectra that allow scientists to identify what they are. "The most exciting part of this result is that we were able to make these observations of an exoplanet atmosphere with this level of detail, much more than I even imagined was possible," Konopacky said. "We have broken the light from the planet down to such a fine level of detail that the chemical fingerprints of the molecules in the atmosphere are breathtakingly sharp and distinct. This is important because it requires data of this quality to truly probe the makeup of a planetary atmosphere, and in turn, say something about how the planet formed." The scientists detected water and carbon monoxide in the exoplanet's atmosphere, but not methane. The lack of methane "tells us that there must be mixing between the different layers of the atmosphere, much like a lava lamp swirls material up and down," Konopacky said. "Since methane is a sensitive molecule, it can be destroyed when it gets mixed into the deeper, hotter parts of the atmosphere. This mixing tells us about the atmospheric conditions in young Jupiter-like planets." This high ratio of carbon to oxygen is a clue regarding the exoplanet's formation. The researchers suggest that grains of water ice condensed in the disc of matter surrounding HR 8799 that gave rise to the planets orbiting the star. Oxygen inside the ice depleted any other oxygen for the formation of HR 8799c. "These ice grains stuck together to make bigger ice chunks, a few kilometers across, that kept colliding and building up the planet's solid core," Konopacky said. "The atmosphere came later — from gas that the planet attracted after it got big enough. By the time that happened, some of the ice grains were gone and the gas didn't have as much water in it." These findings imply that a planet-building mechanism known as core accretion led to the formation of HR 8799c, "much in the same way we think the planets in our own solar system formed," Konopacky said. The exoplanet's core arose first, and the atmosphere came afterward. "These results represent a first step in finding direct evidence about how planets form, which in general, is a difficult thing to do observationally," Konopacky said. "It is really exciting that we have these tantalizing suggestions that this extrasolar system that looks like our own solar system in so many ways may have formed in the same way." Researchers are now tinkering with existing models of core accretion to see how planets might form via the process at great distances from their stars. For instance, there may be more matter at the outer edges of the protoplanetary discs of matter around stars that give rise to planets than before thought, or perhaps solid matter could stick together and form planetary cores easier or faster than previously suspected. "By further refining the core accretion model of formation to explain the HR 8799 planets, we may be able to learn more about the formation of planetary systems in general, including our own solar system," Konopacky said. "We would also like to discover more planets through direct imaging that can be studied at this level of detail," Konopacky added. "We work on a new instrument called the Gemini Planet Imager that is designed to do just this. It will arrive at the Gemini South Telescope in Chile this year, and discover new planets that are both smaller than the HR 8799 planets and closer to their parent star." Konopacky and her colleagues Travis Barman, Bruce Macintosh and Christian Marois detailed their findings online March 14 in the journal Science.